To pull off a fantastic surprise party, you've got to put your party planning hat on in a big way. So we asked advice from one of our favorite party experts, Melanie Blodgett of Hip! Hip! Party GoodsÂ and Bright Box, the ever-so-cool line of modern light boxes. 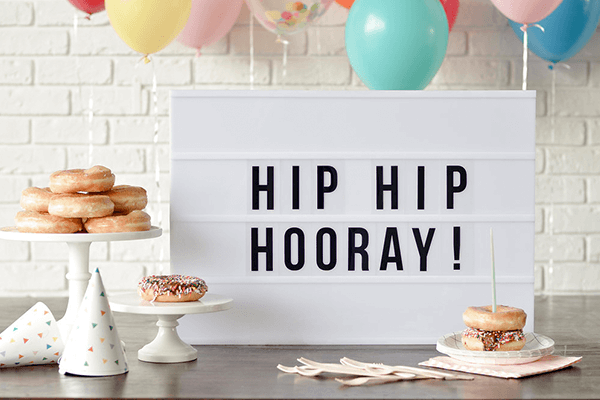 Follow Melanie's go-to simple solutions to plan a surprise party that goes off without a hitch and with a bang of style. It's easier than you think. Birthdays are so much fun -not just for the birthday boy or girl, but for the loved ones celebrating! Show friends, siblings, children, parents - whoever it is that's celebrating a birthday - just how you unique they are with creative birthday gifts that transcend the everyday...because this isn't just any old day! What easier way to be creative than to tailor your gift precisely to its recipient? Whether it's a personalized engraving, a monogram, or a favorite quote, emblazon it on anything from home and office décor to clothing and jewelry. Other ideas? A professionally bound book filled with pictures from your favorite trip together or a personalized novel or love story (yes, they make those!). You can't unwrap an experience. Whether it's a driving a racecar, flying lessons, or cruising peacefully past a sunset, an adventure is possibly the ultimate creative birthday gift. For each birthday, there's a specific birthstone, astrological symbol, birth flower - or, in the Chinese Zodiac, an animal related to the birth year. Draw upon those tried and true symbols to shop for a gift that honors the moment your recipient entered this world! It doesn't have to be Valentine's Day to buy a romantic gift for your babe. Watch her eyes light up when you gift her with diamond earrings - or watch his jaw drop when you present him lingerie you'll be wearing to present him with his...birthday cake. Did you know you could name a star after someone or buy her an acre on Mars? This kind of idea is unrivaled when it comes to creative birthday gifts. A walking tours, a group whitewater-rafting expedition, or any other group activity is creative and unexpected because it involves not just the recipient and you, but also all the other people who light up the life of the birthday boy or girl! We don't always land where we were born and raised - but our hometowns never leave our hearts. Honor someone's birthday will a wall hanging, a pillow, a T-shirt, or a piece of jewelry that pays homage to the place he left - but that will never leave him.